Over the time, as social media has grown, and its total user count has reached more than, a lot of messaging apps have popped up. Some created by famous corporates like Facebook, others that were initially completely unknown, such as KIK. But the social landscape is quickly evolving. The messaging apps that are being used today may not be used tomorrow. One thing’s for sure, though. Mobile messaging is on the rise, and never in the history of this earth has mobile messaging been more popular today, allowing people to communicate with people from all around the world in a heartbeat. In fact, more than 1.4 billion people used mobile messaging apps in 2016, which is an increase of almost 16 percent over 2015(!). A study by Nielsen found that 59 percent of people use messaging apps more today than they did two years ago, which is not that surprising when you look at the number of people who are using the different messaging apps (more on that later). 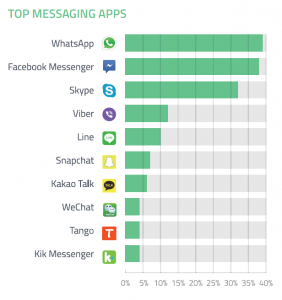 The study also found that 56% of people will use chatting apps more within the next two years. As people are spending more time on social media messaging apps, brands should be there to meet and engage with them. Because where your customers are, you should be too. What’s more, since many people now have messaging apps as their favorite way of communicating online, they even expect you to be there to respond to their questions and comments. In other words, customers will be trying to reach you through the messaging apps, but if you aren’t there to meet them, they might go somewhere else. In the worst case, your competitors. A common misconception that marketers who are negative to the idea of using messaging apps have is that people are only using it to chat with friends. But this is obviously not true. In fact, 67 percent said they expect to use messaging more for communicating with businesses over the next two years. People are using messaging apps to communicate with brands today, but even more, people will be doing it in the future. It means that if you aren’t using messaging apps to communicate with your audience today, you’re missing out on incredible opportunities for engaging and interacting with your audience. It also means that if you’re not prepared for the shift when people start abandoning traditional way of communicating with brands, which is by phone or email, you’ll stand there, offering ways of getting in touch with you which no-one wants to use. Moreover, you’ll also lose a ton of potential customers, because, as mentioned earlier, where your audience is, that’s where you want to be. There’s no point in putting banner ads in the middle of the woods, right? Because the truth is, messaging apps can be used in a variety of different ways by brands. It can be used for managing customer service, marketing your brand, improving your customer relationships, and much more. There’s a whole array of messaging apps that you can be used for marketing, but in first hand, you want to be using the messaging apps which are the most popular. Because obviously, that’s where most of your customers will be found. However, you also want to factor in that the different messenger apps have different user bases, which means that the largest messaging app might not be the app where most of your customers can be found. WhatsApp is the largest online messaging app in the world, boasting a whopping 1.3 billion monthly active users, up from over 1 billion monthly active users in February 2016. Whatsapp was acquired by Facebook in February 2014 for approximately US$19.3 billion, which proves the sheer size of the messaging app. What’s more, 50 billion messages are sent every day. A large part of WhatsApp’s users are from the United States, but it is also highly popular in Asia, Europe, and South America. When talking about messenger apps, we cannot forget to mention Facebook messenger, as this is an app that is highly popular, considering that it is a natural choice for people who are using Facebook. At first, Facebook Messenger was incorporated into the Facebook interface, but a few years ago, it became an individual messaging app, appropriately named Facebook Messenger. Since Messenger and WhatsApp are owned by the same company, you can expect them to share a couple of similarities, which is exactly what they do. However, the main difference is that the Facebook messenger app is created to help you communicate with Facebook friends, rather than phone numbers. Facebook Messenger has been an immensely popular communications tool for brands for a couple of years, but as Facebook introduced business bots, which allows brands to respond to their customer’s questions with bots, its popularity has increased dramatically, since brands can see that they can have bots do parts of the job that was previously done by humans. In fact, today, there are more than 100,000 monthly active messenger bots. To prove the extensiveness of Facebook Messenger for businesses, people exchange 2 billion messages per month with businesses on Facebook Messenger. In other words, if you aren’t yet using Facebook Messenger for communicating with your customers, you’re most likely missing out. The most common way brands are using messaging apps is to help their customers – to provide customer service. 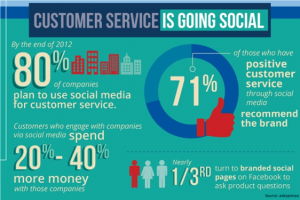 Part of that is because it is often for that reason customers reach out to brands. And obviously, if the customer is using a particular app or social platform, that would be the natural choice for them contact a brand with. I’ve already mentioned one of the reasons why people are beginning to use social platforms and messaging apps to reach out to brands, and that is because they’re already using it. All they have to do is shoot a message. The other main reason is that as information is moving at the speed of light, giving people the ability to reach people in a matter of seconds, people are impatient. They want things to happen, and they want things to happen now. This also goes for you responding to their customer service messages. 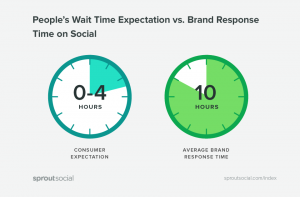 In fact, a study by SproutSocal found that people expect brands to respond within 4 hours on social media. The problem, however, is that brands respond, on average, after 10 hours. And when it comes to the traditional ways of communicating with your customers – being mainly through email and phone, it’s even worse. If you reach out to a brand by sending them an email, very seldom, you get a response back within 4 hours. Add 20 hours and it’ll resemble the reality a little bit better. And if you’re reaching out to a brand through phone, it might even be more frustrating. 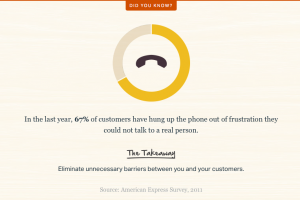 In fact, according to Helpscout, 67% of customers have hung up the phone out of frustration they could not talk to a real person. Messaging apps are great for customer service, not only by leveraging the power of chatbots, but most importantly for human interaction. They allow you to talk to your customers in real-time, and respond to them on the spot, and, if used correctly, give them a response within a matter of minutes. Quite a big difference from 4 hours. Messaging apps allow your customers to communicate with your customers instantly, but this also demands that you have the resources for doing so. People are using messenger apps to get quicker responses from brands, but if they cannot get that, you’re missing the point. It is therefore important to realize that while messenger apps are tremendous tools for customer service, you need to have the resources for providing your customers with the customer service that your customers are expecting. Because the quicker you can respond to your customers, the better. For social media, people expect brands to respond within three hours, but when it comes to messaging apps, 42 percent of consumers who use messaging tools to contact businesses expect a response within the hour. A brand that has embraced messaging apps is the hotel chain, Hyatt. In fact, they realized the importance of being reachable on there all the way back in 2015, because their customers were clearly spending time there, and therefore also wanted to use those platforms to effortlessly reach out to the brand. What messenger apps allow you to do is have one-on-one intimate conversations with your customers, allowing both you and the customer to share information that may be too private to be shared out in the open on social media for everyone to see. Another great benefit of taking your customer service to messaging apps is that it allows you to have more intimate conversations with your customers, thus allowing you to improve your customer relationships, making them more loyal in your brand. My favorite benefit of using social media messaging apps is that it allows you to access a ton of information about your customer when chatting with them, considering the fact that so many people are essentially sharing their whole lives online. What this allows you to do is access that information, and with that information get a better understanding of who it is you are talking to, and in that way be able to provide your customer a much better, and more personalized experience. Few brands think about this hack, but it is a very effective one that will leave your customers more loyal and loving towards your brand than they’ve ever been before. Because when you provide a customer service that is more personal, it will make it seem like you’ve known each other forever, thus greatly increasing people’s level of trust in you. Where you have your audience’s attention, you can market your brand. And the channels where you have just that, you should be leveraging them to promote your brand. It means that through the messaging services, you can reach out to your customers one by one and let them know what’s new. But you should use this tactic with caution though. Because messaging apps aren’t yet saturated by promotions and marketing from brands, yet, but instead, the majority of messages being from friends, people are opening the vast majority of messages. But remember email, for example. If you used emails back in the days, let’s say ten years ago, you probably opened every single email you received, right? In fact, you delete the spam- and marketing emails you’re receiving instead of unsubscribing to them because it takes more time to unsubscribe than it does to just delete them. Now am I saying that the same will happen with messenger apps? What I am saying is that unless your message doesn’t provide value to the person you’re sending it to, don’t send it. Because what will happen is that people will start seeing you as a spammer, they’ll stop opening your messages, or even worse, they might block you. Therefore, avoid sending messages to your customers through messaging apps all the time, but save your messages to when you actually have something relevant to say which brings your audience value. This way, you ensure that people continue to open them and that your marketing has any effect. This strategy is the very best if you’re sending marketing messages that are personalized. If you’re just sending them a message saying ”hey, we just released a new product, check it out”, the message won’t feel authentic and genuine. It will feel like just another spam message. But if you instead take the time to write more personalized marketing messages, I promise you that you’ll generate far greater results. ”Hey Alex, hope all is well! I know that you said you loved cats, and when we came up with the idea of making prints of cats, I immediately came to think about you. Feel free to take a look here: yourlink.com. Would love to hear what you think! 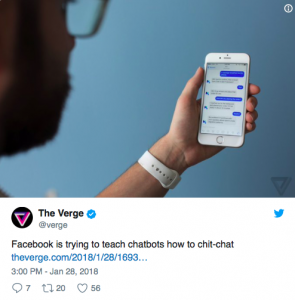 I’ve already mentioned chatbots briefly, but because they’re increasing dramatically in popularity, and more and more brands are using them, let’s look at how you can leverage them in your messenger marketing. It obviously has several other benefits, such as the fact that it is saving you money, but when it comes to marketing metrics it can help you achieve, these are the most important ones. 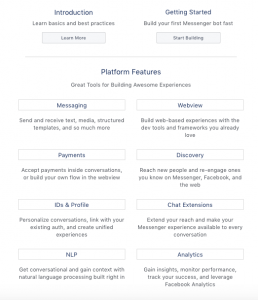 Through Facebook’s developer page, you can start developing your very own chatbot today. A brand that has embraced chatbots on Facebook messenger is Sephora. The brand uses the chatbot to tell their customers the closest dates, times, and locations. From the bot, people can book appointments directly, and then, receive a confirmation email – all managed by the bot. In fact, Sephora saw an 11% increase in booking rate through Sephora Reservation Assistant vs. other booking vehicles. Chatbots have indeed proven to be effective in marketing. 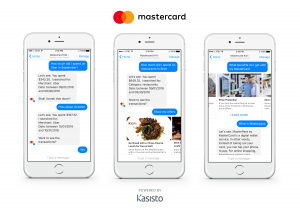 According to Kik, brands using chatbots on the network see three to four times higher open rates for push notifications than the typical open rates for brand emails. Sephora has also embraced chatbots on KIK as well. 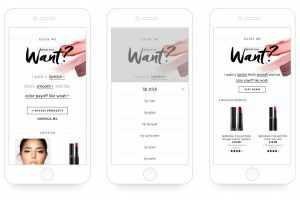 On the messaging app, they use their “Beauty Uncomplicator” quizzes, which gives them more information about their customer’s needs, thus allowing the bot to give them service based on exactly what products the customer is interested in. In other words, an effective way of personalizing your customer interactions, and making that individual customer central in the conversation. Moreover, Kik also reports that 70 to 90 percent of users who chat with lifestyle brands complete the quizzes that are available. In other words, a tremendous way for you to engage your audience and give them relevant customer service, which is just what they are looking for. You’ve probably seen various chatbots fails by brands, but the good news is that as the technology evolves, the bots become more intelligent, and even more impressively, start getting an own personality. When chatbots were new inside the messaging apps, they weren’t very advanced, which made the interactions feel very robot-like, plus, the conversations had to follow a certain pattern in order to work. Luckily, it is better now, and the chatbots will improve a lot in the coming years. Therefore, if you’re going to use chatbots on messaging apps, you want to develop them in a way that makes them provide high-quality answers to your customers. Facebook started 2018, for instance, buy working on developing chatbots with a “consistent personality”, which gives them the ability to carry on better conversations. 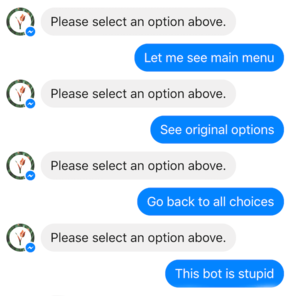 A major problem with chatbots is that they don’t provide context based on what they or their chat partners have discussed in the past and fall back on programmed responses like “I don’t know” when faced with questions they don’t understand, and as a result, the conversations with chatbots can become awkward. But now researchers and developers are trying to learn chatbots to see patterns, and thereby be able to follow conversations patterned off of natural human dialogue, and develop “personas.”. Personal and authentic interactions are what lays the foundation for an engaged and loyal audience. And what lays the foundation for a community is a loyal and engaged audience. The best part is that by building your community, you further engage your audience and make them more loyal to your brand. This can be done using messenger apps. A way you can leverage messaging apps to build your community is by creating private messaging groups, where only a selected number of people get invited. Humans love to feel like they’re getting exclusive information and access, so that’s exactly what you should do. To begin with, you should invite your most loyal supporters. Then, begin promoting your VIP group, because what will end up happening is that more people will start being loyal and engaged in your brand. You have to remember, though, that only sharing pieces of exclusive information isn’t enough. Ultimately, what builds relationships is good old personal interaction, and this is something you want to greatly emphasize. Take the time to give the latest news to your group of loyal customers, respond to their questions, and ask questions back. Doing this will also provide you with lots of feedback. The best part is that your most loyal customers are probably also the people who have the biggest experience with your brand, and might, therefore, be able to give you feedback on how you can improve. The smaller group, the more intimate and connecting the interactions will feel. This is why, you need to think about if you want to make a small and intimate group of only a small number of people, if you want to create several groups, or if you want to create one big group. If you’re going to use chatbots, a way of doing so is by making it possible to order things through it. Burger King, for example, has developed a Messenger bot which allows their customers to place their food before they arrive, as well as get an update on when the meal is expected to be ready. Here’s a demo of what the process of ordering looks like. With the help of the chatbot, you can order your meal within a matter of seconds without a lot of effort. What this does is it simplifies the purchase process. And since the process of ordering is so simple, making the food ready when you enter, people will be more likely to buy from you. It’s no news that the easier the order process is, the more people will be likely to buy from you. Brands like Taco Bell and Domino’s have also hopped on the messenger bot wagon to simplify their customers’ ordering process. Arranging contests and giveaways is a great marketing tactic, because who doesn’t love free things? But the best part about contests is that they can help you achieve multiple marketing objectives. The thing is, there’s no real point in having a bunch of accounts on various messenger apps if nobody is writing to you, right? And while many of your customers may be using the messaging app you’re using, they might not be writing to you. So what can you do to encourage people to start writing to you on the messaging apps? The most common forms of contests you’re seeing are contests where people have to ”tag a friend”, or ”share a photo”. But what if you can leverage messaging apps when running your contests? In a number of different ways, actually. Depending on the objective of your contest, you’ll obviously set up your contest in different ways, but one way is to have people write to you in order to join. If you want to make the rules of entry simple, you can simply ask people to send a message to you. If you want to take it one step further and leverage your contest to get customer feedback, you can simply ask your audience to send a message to you telling you what they think about your brand and products, how you can improve, and what they think is the best about your brand. Doing this provides you with tremendously valuable feedback that allows you to improve your business. If you want to create a contest which encourages user-generated content, you can ask your audience to send pieces of UGC to you through the messaging app you’re using. As you probably know, UGC has proven to be very effective in marketing, and what’s more, it also provides you with lots of content that you can implement in your marketing strategy. As you see, there are a million of different ways you can leverage messaging apps when running a contest. To decide which you should choose, ask yourself what your goal with the contest is, and then look at the different ways you can set up a contest with a messaging app which allows you to achieve that objective. A great thing about this is that when your audience writes to you, you’ll know the people who are most engaged in your brand. Then, you can simply use the marketing tactic mentioned earlier, where you strategically promote things to your audience in a personalized way, which will make them value your message more. There is no doubt that a lot of the future of messaging apps for brands will be driven by chatbots. And it’s no surprise really. Bots respond within an instant and can provide the exact answer that customers need. Chatbots also save brands both time and money, erasing the need for a real person answering all the messages. Today, the chatbots are far more advanced and developed than they were when they were first launched, but chatbots also have several areas in which they can improve. And all of that will come, it’s just a matter of time. Sooner than we think, we’ll have chatbots that sound, and acts like a human and can provide instant high-quality responses. 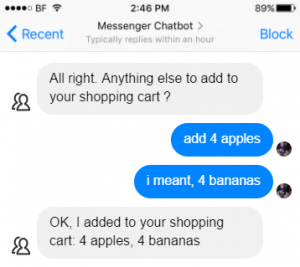 But messenger apps aren’t only effective in marketing when using chatbots. In fact, it also holds several benefits for brands, as it gives them a direct channel to communicate with their audience, thus giving them loads of opportunities to leverage messaging apps.